500 is twice more than 200 and then some. What wasn't just as plain—to me at least—is how far April Music's new 500 Series would press beyond their existing 100 and 200 models. In hindsight, numerology or math might have predicted it. On the bigger hifi map, the previous kit from our Koreans suggested a perhaps Arcam or Rotel positioning. Having only come across these small photos to the right when accepting the 500 assignment, I had somehow seen Stello CDT100 | DA100 Signature type gear, still petite but now stylistically gussied up. What arrived instead suffered no such fools. Cosmetics, size and finish recalled certain simaudio Moon kit. Instead of the finned sides, macho stanchions and overhanging face plates, April Music went sleek and elegant however, their non-grained aluminum finished in truly luxurious fashion. This was wildly more ambitious stuff, its target audience more upscale yet still lifestyle conscious. Was the brand moving upmarket to give the country an export transistor equivalent to the glowing valves of Allnic Audio and Emillé Labs? April of course had pricier gems like the Eximus A-1 preamp already. They simply had never yet featured on their global website, only the Korean one. The company has worked the upper floors of the hifi house for years. Did they now think the time right to announce it to the world? 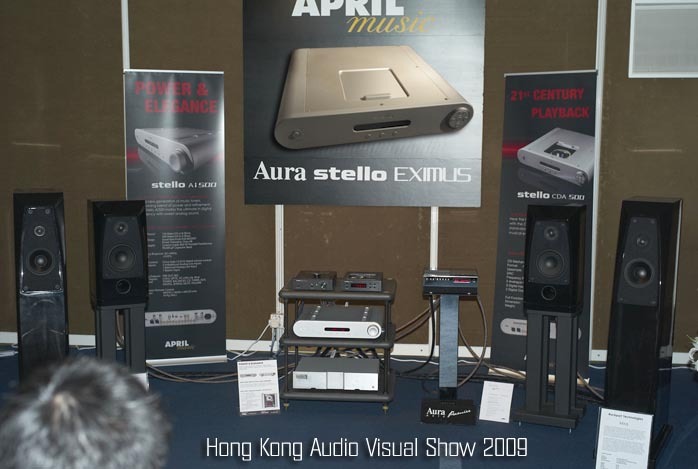 Were the 500 Series products intended to prove that April Music could compete against more serious Western competitors? With the added precedent of the Eximus CD-10, preparation for such a move—if that's indeed what it was—had been underway for a while. USB x 2. As connectivity on the tail end of either new 500 machine shows, USB figures big. Before you demur that as a combo, one machine's digital inputs become superfluous in all but complex systems, either piece accommodates PC users even when bought separately. In fact, the CDA500 becomes redundant for those who already listen exclusively to hard-drive or solid-state memory. Anyone shopping for a last CD player meanwhile wants future proofing. Enter numerous digital i/o ports including USB. Balanced outputs on the player and balanced inputs on the integrated reflect a true dual-differential circuitry inside the player, a balanced input stage on the amp to be more than just convenience features. On connectivity, the full-size drawings tell all. Take note that the pre-out and bypass sockets allow the integrated to be run as pre or power amp. 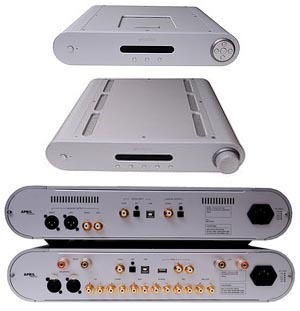 Naturally, the pre-outs could optionally go to another Ai500 for biamping or an active subwoofer, the bypass option interface with a theater's pre/pro as the master controller. Clearly the 500 machines were conceived to be unusually flexible and accommodating. 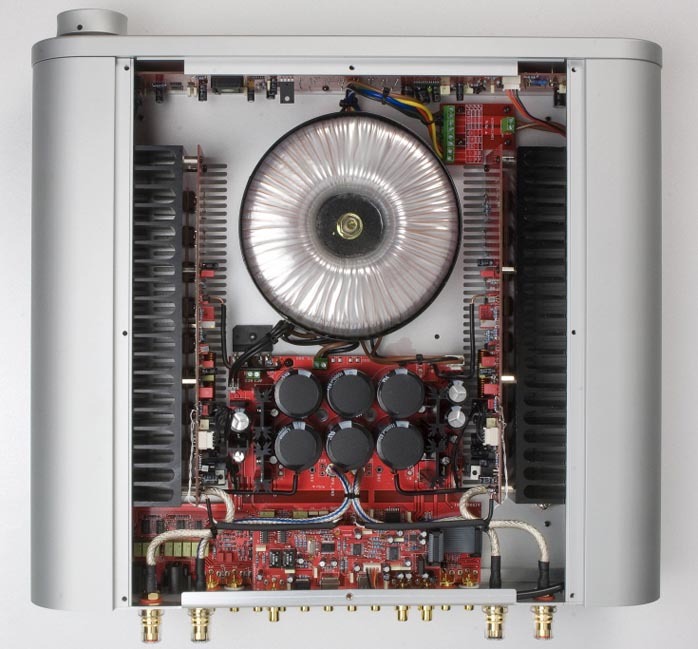 The integrated amplifier: The Ai500 is a 150/300wpc 8/4-ohm direct-coupled design. It operates a class AB quad-parallel push-pull output stage with Hitachi 2SK1058/2SJ169 power Mosfets. The power supply runs an 800VA toroidal transformer and 90,000uF capacitor banks. Feedback factor is given as 0.018. 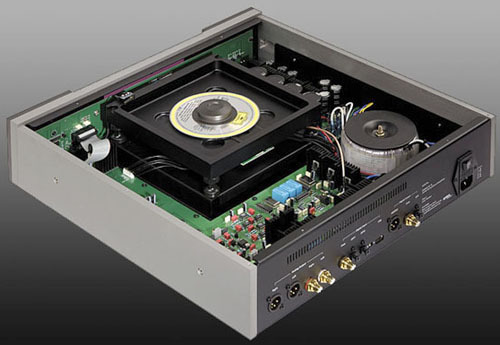 The front end is a discrete dual-differential class A preamp stage with very high input impedance. Overall circuit gain is a high 35dB. 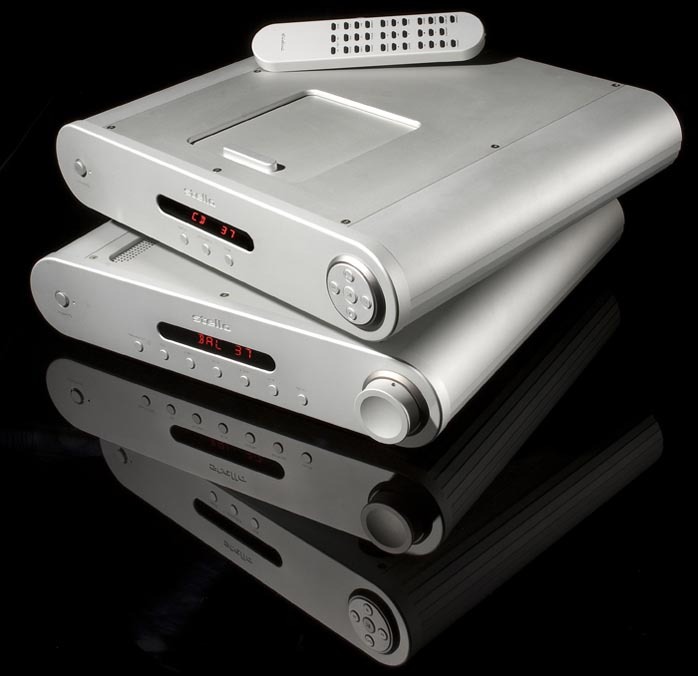 Volume control is by Cirrus Logic's CS3310 chip, speaker protection by sealed dust-proof relays. Dimensions are 435 x 94.5 x345mm WxHxD and weight is 16kg. The large red display is dimmable including off and the power LED for standby indication is a very attractive small white for a change. The amp turns on and off without any transients and transformer hum is utterly non-existent. The rear panel shows line voltage options of 100, 120, 220, 230 and 240. This suggests discrete secondaries—or different transformers altogether for each of the five AC zones—rather than just the customary two or three line voltage 'matches'. The insides shows a tidy combination of circuit boards and flying leads, solid-core wire connections and just one short ribbon cable. The output leads are reassuringly chunky and nicely shielded. 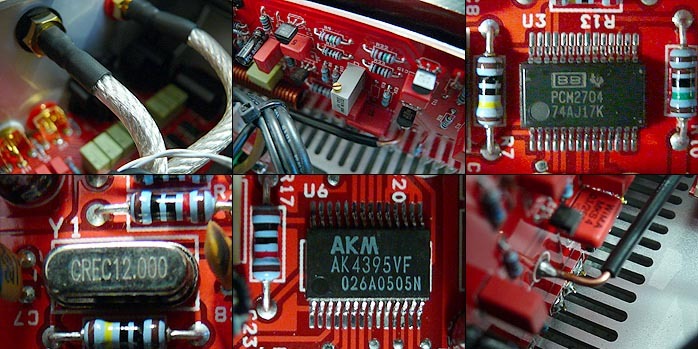 On the digital input side with equal-opportunity processing for USB and S/PDIF, the AKM AK4395VF from Asahi Kasei Microsystems is a 5-volt multi-bit 24/192 engine with 128 x oversampling (the DAC of the CDA500 meanwhile is based on the Cirrus Logic CS4398 chip) while the Burr Brown PCM2704 is the popular USB interface for both machines. In use, the amp gets quite warm to suggest bias into class A to perhaps 10 or 20 watts. Now let's step back from the review subjects to learn from April Music's president about the company, where it's been and where it is going.